Green Goddess Chicken Salad is baby lettuce mixed with apple, roasted chicken, nuts, & cheese topped with green goddess dressing. Weight Watchers friendly- 3 SmartPoints! One of the main reasons I love to cook is because cooking is my creative outlet. I’m not an artist or musician, so food is my canvas. Aside from tacos and soups, my favorite food I like to be creative with are salads. The possibilities are endless! My Green Goddess Chicken Salad is packed with fresh flavors perfect for a lunch or dinner salad. 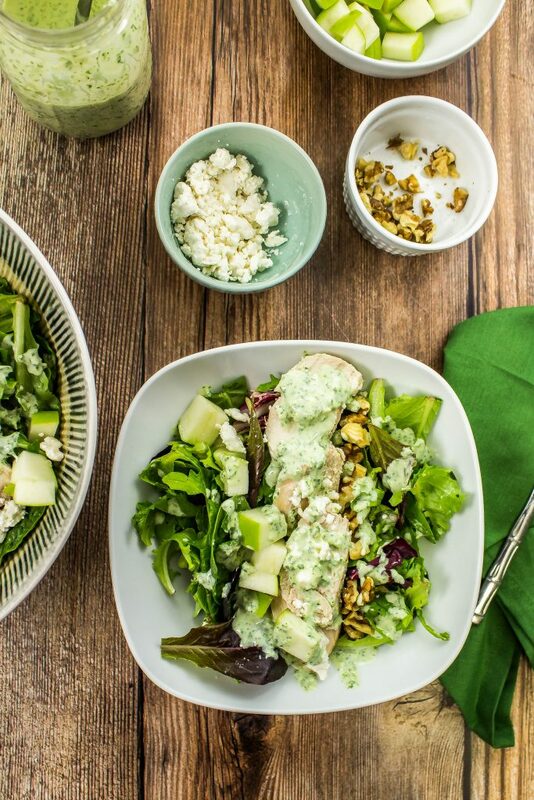 Baby spinach and romaine lettuce mixed with green apples, oven roasted chicken breast, walnuts, and feta cheese topped with tangy green goddess dressing. This is a Weight Watchers friendly recipe and each serving is 3 SmartPoints. In late Winter my husband and I went to visit our friends in Madison, Wisconsin. Not only did we love the city, but we LOVED the food. After two days of complete indulgence, one of my last meals in Madison was an amazing chicken salad. While everyone around me was eating waffles and burgers, I decided to be the odd woman out and order a salad. What caught my eye when reading the menu was a green goddess chicken salad. Creamy cheese, apple, nuts, and mixed greens topped with herb creamy dressing… definitely a better choice than a burger! I really didn’t know what green goddess dressing was until a few years ago. Fresh herbs blended with mayo and sour cream… what’s not to love?! Green goddess dressing goes perfect with roasted chicken and creamy cheese. I thought about that salad for about a week after I ate it and knew I needed to recreate my own version at home. The key to a good salad is to mix ingredients that have different textures and tastes. What makes this salad stand out is the mixture of crispy green apples, crunchy walnuts, and creamy salad dressing. I remember when I made this salad for the first time, my husband thought it was weird to add apple to a salad, but after he took a bite he totally liked it! I try to create meals that can easily be made ahead of time, that way it’s easy to make it the night before and take it to work the next day for lunch (or for a super quick dinner). This recipe starts with the Oven Roasted Chicken Breast. The chicken can easily be made on Sunday (which is when I make the chicken) so that you can have it ready and on hand during the week. The salad dressing I use for this salad is my Lightened Up Green Goddess Dressing. The dressing can be made ahead of time as well. This salad dressing is fresh, tangy, and creamy perfection. Make it on Sunday and it will stay fresh in the refrigerator for up to 5 days! For my version of a Green Goddess Chicken Salad, I use baby spring mix diced green apples, chopped walnuts, and feta cheese. 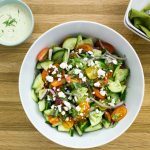 You can use whatever cheese you like, but I personally like feta cheese because it’s salty, tangy, and creamy… a perfect combo with crisp lettuce and apple. 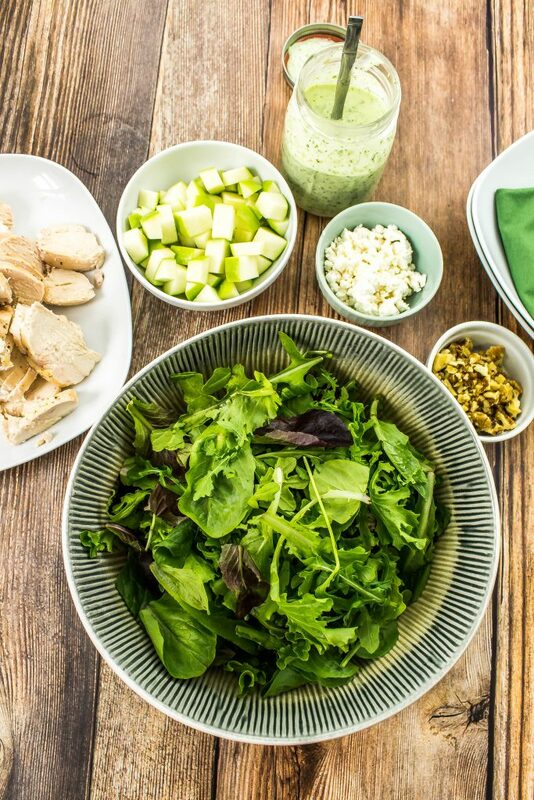 Green Goddess Chicken Salad is packed with fresh flavors perfect for a lunch or dinner salad. 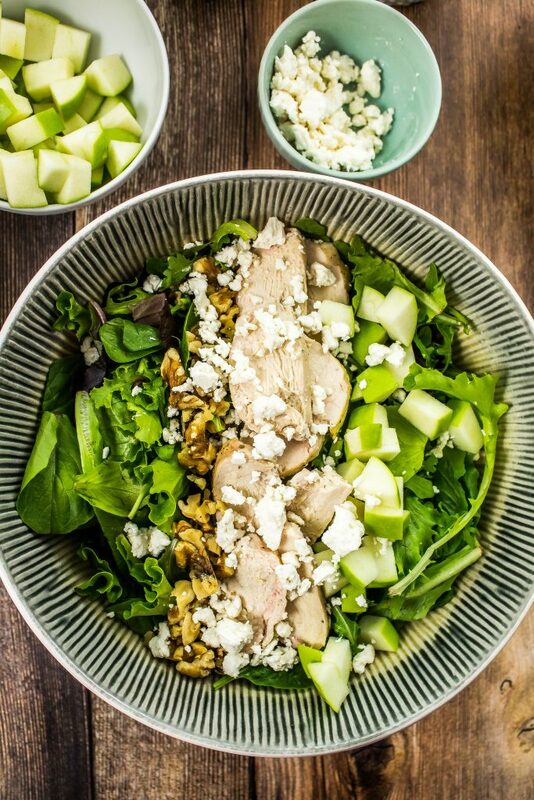 Baby spinach and romaine lettuce mixed with green apples, oven roasted chicken breast, walnuts, and feta cheese. Topped with tangy Lightened Up Green Goddess Dressing. Make the salad ahead of time for a grab and go lunch during the week. 3 Weight Watchers SmartPoints per serving! Make Lightened Up Green Goddess Salad Dressing according to recipe instructions. Make Oven Roasted Chicken Breast according to recipe instructions. 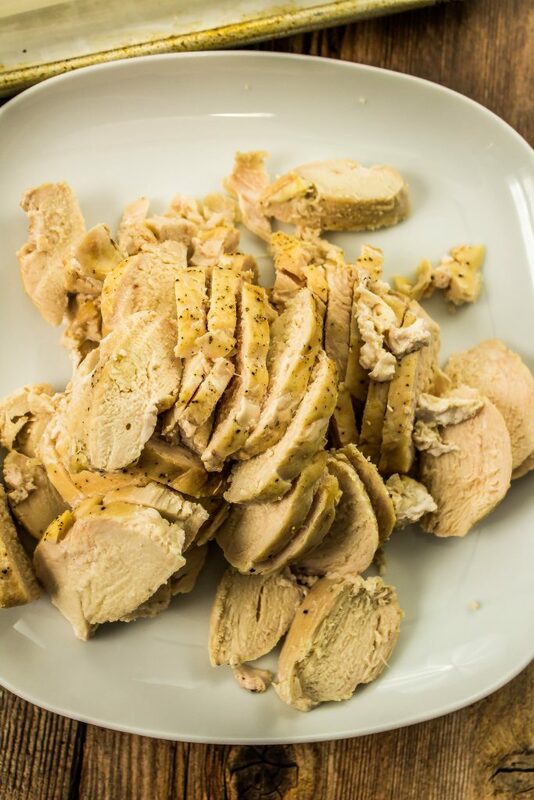 Once chicken has baked and cooled enough to handle, cut into thin slices. Dice green apples and set aside. 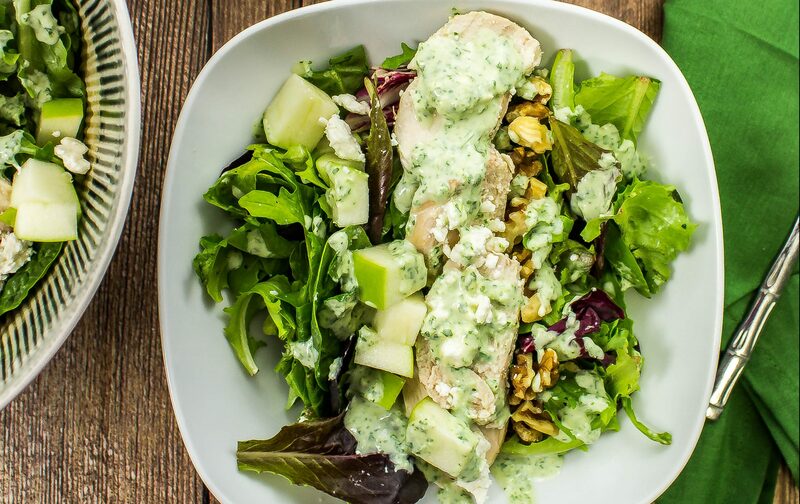 To a bowl add a handful of baby spring mix, ½ diced apple, ½ cup sliced chicken breast, 1 tablespoon walnuts, 1 tablespoon feta cheese, and top with 2 tablespoons Lightened Up Green Goddess Dressing. 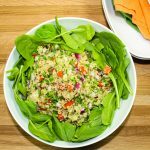 July 28, 2017 at 9:38 am Absolutely love this salad combo and plan to make it this week! Loving that bold color of the dressing but really can wait to taste it! July 31, 2017 at 9:57 am I hope you like it Jen :)! July 28, 2017 at 11:04 am Yummm! This sounds so fresh and flavorful! July 31, 2017 at 9:58 am I hope you like it Jess :)! 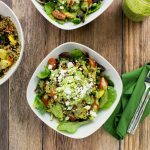 July 31, 2017 at 9:57 am You will love this salad Gabby!! July 28, 2017 at 1:51 pm This sounds so delicious and light. My hubby and I are always looking for light, fresh meals this time of year! I think the Green Goddess will make its way into our dinner rotation soon! July 31, 2017 at 9:56 am Great! I hope you guys enjoy it!! July 28, 2017 at 2:55 pm This looks like a very yummy salad! I am trying to eat more salads and will have to try this one! July 28, 2017 at 6:02 pm Even the name sounds appetizing! 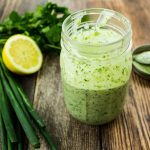 July 28, 2017 at 7:19 pm So in love with green goddess dressing! I never knew it was so simple to make at home. July 31, 2017 at 9:56 am It's so easy Mila :)! July 28, 2017 at 7:35 pm Yummmm! 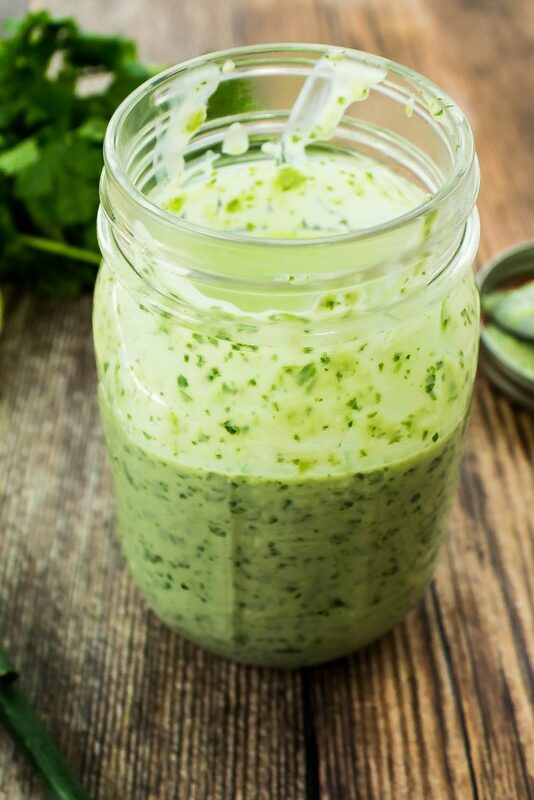 I've had several versions of Green Goddess dressing, but never a lightened up one. I'll give this a try! July 31, 2017 at 9:55 am Yes, totally :)!! July 28, 2017 at 8:55 pm Hooray! I've been looking for a way to use up some feta in my refrigerator. Now I know what I'm making for dinner tomorrow. Thanks for the inspiration! July 28, 2017 at 9:12 pm We did a home football game weekend in Wisconsin a couple of years ago and had the best time! And yes, it's easy to eat lots of indulgent foods. Your salad looks delicious, whether to eat right or just to eat. July 28, 2017 at 9:23 pm Yum - this sounds absolutely fantastic. I love a good salad. July 28, 2017 at 11:18 pm This looks so fresh and delicious! I want to try it this weekend! July 31, 2017 at 9:54 am I hope you do Jordyn! July 29, 2017 at 1:22 am This looks ridiculously good! I am so making this for a work lunch at some point this week! July 31, 2017 at 9:53 am It's the perfect lunch salad Kim! July 29, 2017 at 1:46 am This looks really good and healthy too! Thanks for the great meal idea! July 30, 2017 at 4:49 pm Wow, need to whip this up for dinner! July 31, 2017 at 9:52 am You should Lauren :)! July 31, 2017 at 1:01 pm This salad looks delicious! It is definitely something I'd love to eat for lunch or dinner. Looking forward to trying it out. October 4, 2017 at 12:06 am Thank you for sharing this recipe. This is one of the best green salads I have ever tasted. You are truly an artisan. Looking forward to more recipes from you. October 4, 2017 at 9:19 am Oh I'm so glad to hear you liked the salad Sheila! I personally LOVE that one :) Thank you! !